Ben, a highly intelligent middle school boy who excels at Chemistry, has always had a great relationship with George, his "concentric twin" who lives inside him and often helps him with his schoolwork. Lately, though, Ben and George have begun to disagree about Ben's actions, particularly when it comes to Ben's sudden interest in gaining the approval of his classmates. 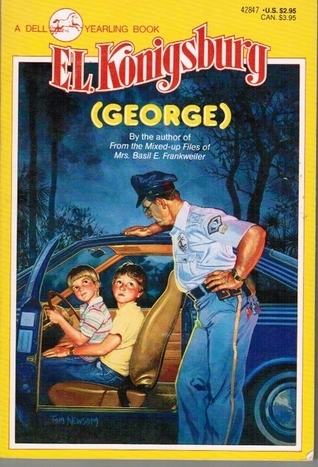 When George stops speaking to him, Ben becomes concerned that he has lost him forever, but the adults in his life become more concerned about his mental health. Though E.L. Konigsburg has been a favorite author of mine for years, I kept putting off reading this book because of its strange premise. When I finally decided to dive in, however, I quickly became enamored of the writing style and fell happily into the world of the story. The best way I can describe this book is to say that it's like A Beautiful Mind for middle schoolers. Is George real? Is he a manifestation of some mental illness? Would it be better or worse for Ben to lose George's voice inside of him? These are the questions this book asks readers to contemplate, and though Ben resolves his conflicts for himself, the overarching questions of the story are left open to the reader's interpretation. This is the kind of book that will probably never have mass appeal, but which might be just the right thing for a highly intelligent kid who is struggling to choose an engaging book to read. Kids who like Konigsburg's more mainstream books (i.e. From the Mixed-Up Files of Mrs. Basil E. Frankweiler or The View from Saturday) might be surprised by the strangeness of (George), but boys, especially, who are struggling socially in early adolescence will relate to Ben and his desire to obscure the truth hidden deep inside of him in order to fit in. Konigsburg had one of the most unique writing styles of any children's author, and this unusual book just proves that she can make a compelling story out of even the most unlikely of premises.